Hawaiian Pohole ferns pronounced poh-HOH-lay, are a rich deep green and produce large fronds that range from three to six feet long. Vibrant green shoots unfurl from the coiled fernhead and are harvested from the interior when they are between 6 and 9 inches tall. This edible fern has a subtlety sweet and nutty flavor with a slightly chewy texture. Its taste has been compared to both okra and asparagus. Hawaiian Pohole ferns are available year-round. The fern is known in Maui as Pohole ferns, ho'i'o on Hawaii, called pako in the Philippines and known as warabi in Japan and kosade in Korea. Pohole ferns are 98% water, high in iron and provide some calcium and magnesium. The Pohole fern is entirely edible and may be eaten fresh or cooked. Snap off the bottom end as you would asparagus, then blanch to preserve their color. Pohole ferns pair extremely well with tomato and onion. Try adding to a stir fry at the last minute or add raw fern tops to a salad tossed with a light vinaigrette. They are delicious served atop a pizza or flat bread and make a great addition to omelets and frittatas. To clean, rinse lightly in water to remove any fine hairs on the fern. They will keep refrigerated for a week. The Pohole fern grows wild in the rain forests of eastern Maui. The Hawaiian rain forest's tropical climate is credited for their flavor and succulent texture. Traditionally in old Hawaii Pohole ferns were stored wrapped in tea leaves, a method used to keep produce fresh. Recipes that include Wild Pohole Hawaiian Ferns. One is easiest, three is harder. 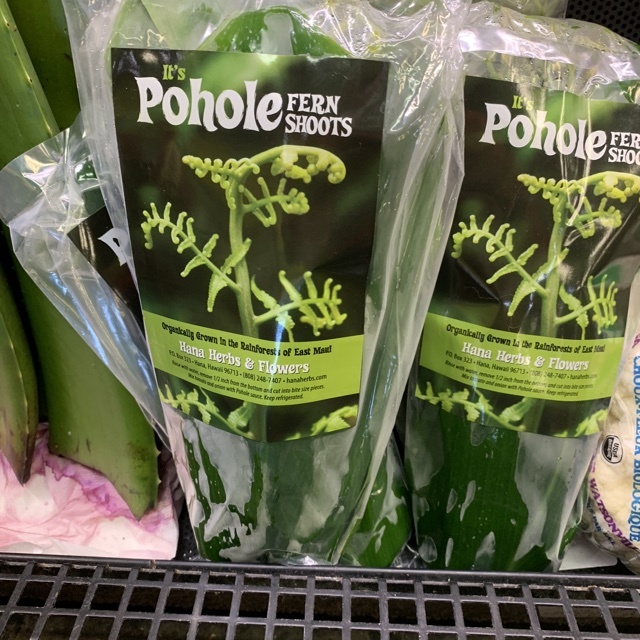 Someone shared Wild Pohole Hawaiian Ferns using the Specialty Produce app for iPhone and Android. Sharer's comments : Wild Pohole Hawaiian Ferns spotted at Down to Earth Organic & Natural.